The out-half has not played since helping Ireland win in Murrayfield and will hope to prove his fitness to return there this week. Carbery in training last week. 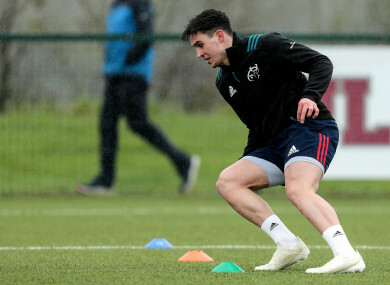 MUNSTER HEAD COACH Johann van Graan is confident of having Joey Carbery fit and starting the Heineken Champions Cup quarter-final away to Edinburgh on Saturday (kick-off 12.45). A hamstring injury has meant the Athy man has not played since helping Ireland to victory over Scotland in round two of the Six Nations. Van Graan says the out-half will be re-integrated into full training this afternoon and is confident Carbery will prove his fitness to take the 10 jersey. Be it as contingency or as a back-up option for the bench, Tyler Bleyendaal put his hand up for selection on Saturday with an impressive second-half showing in the win over Zebre. Van Graan is pleased to see the playmaker show his ability a week out from Europe. “I thought Tyler did really well from the bench at the weekend,” Van Graan said at Munster’s UL training base. Along with the returning internationals, Ciaran Parker will also step back into full training today, while Brian Scott (foot), James Cronin (leg) and Tommy O’Donnell (shoulder) continue their rehab programmes. Email “Munster confident of having Carbery fit to face Edinburgh”. Feedback on “Munster confident of having Carbery fit to face Edinburgh”.